Sinn Féin’s Martina Anderson is sending a new booklet entitled ‘Britain’s dirty war in Ireland’ her 750 fellow MEPs. Speaking at the launch of the book in the Waterside, she said: “One of my priorities in Europe is to raise the issue of collusion and assist families in securing truth and justice. “In 2014 I brought a delegation to the European Parliament to raise awareness of collusion. 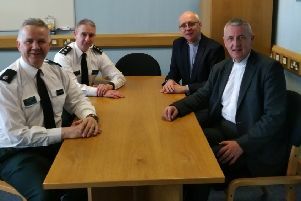 “We discussed how the British state has failed in its obligations under international human rights legislation to safeguard the right to life. “I felt it was important to tell this story to demonstrate how the British state set up and operated unionist death squads to target political opponents and murder civilians during the conflict. “Since then the British state has engaged in wholesale cover-up of its collusion with the unionist murder gangs. “Collusion has had terrible consequences for the families affected. It also exacerbated the conflict in Ireland and resulted in further loss of life and hurt. “I am sending a copy of this booklet to MLAs, TDs, councillors and MEPs to continue to highlight the issue of collusion.